On some factory vehicles with perfect alignment, a flexible coupling (rag joint) was used to attach the column to the steering box. When the stock column or box is altered, the original coupling might not work. Borgeson has the best selection of spline and DD sizes to fit most applications. 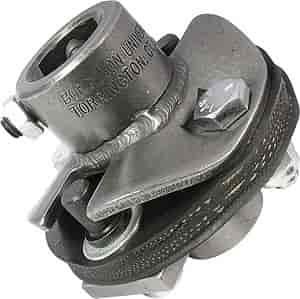 Flexible couplings are available in steel only and should be used only when there's perfect alignment between the connecting shaft and steering box. .